Home Sports Home town Pee Wees win provincials! 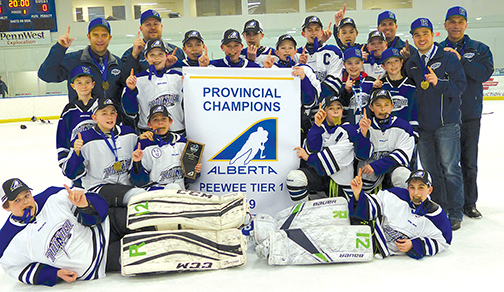 Home town Pee Wees win provincials! The Slave Lake Pee Wee 1 Thunder got into the final of the Tier I Provincial Championships by the narrowest of margins. Nobody who watched their semi-final game would have been surprised if they had entered the final against the LaCrete Lumberjacks without a lot of gas left in the tank. But as it turned out, they had exactly what they needed and more. Even with the disappointment of two disallowed goals, they managed to get a lead and hold onto it and win. A significant factor was a big, boisterous and supportive crowd. The Thunder won 4 – 2 against an excellent team from up north. The Lumberjacks might have won it on another day. They certainly had their chances. Thunder goalie Salah Baalbaki faced down numerous great scoring chances – being good enough, sometimes getting a bit lucky, and often being helped out by timely action by his teammates. The Thunder went up 2 – 0 when lanky defenceman Hayden McClure took a centering pass from Kaleb Van Hoek on a powerplay and wristed it home. As the clock expired on the second period the Thunder thought they’d made it a 3 – 0 game, to thunderous applause from the packed house. But not so fast. After a long discussion, the on-ice officials disallowed it, ruling that the buzzer had gone before the puck crossed the line. That loomed large in the third period, when La Crete scored to make it a one-goal game and were putting on pressure like crazy. But it might just have been a matter of time before Van Hoek broke out again. He was giving the Lumberjack D-men fits all game, swooping around on the outside and getting in close for tight-angle shots. On this occasion, Van Hoek charged deep on the left wing, pivoted to the inside and lost control of the puck. He ended up getting it back, but with his back to the net. He spun around, made a move on the defenceman, made another one on the goalie and found himself in tight on the backhand with a lot of open net in front of him. That made it 3 – 1. The joy in the building was huge. Relief, too. But the Lumberjacks came right back and made it a 3 – 2 game. The tension in the building ratcheted back up several notches as the clock wound down. As expected, the La Crete coach pulled his goalie. With six attackers, the Lumberjacks pressed furiously, pinning Slave Lake in their own end. McClure froze the puck on the boards and drew a whistle with about 17 seconds left, setting up a dramatic finale. It started with a faceoff to the left of goalie Baalbaki. LaCrete won it, back to the left point and Damian Hill skated out to challenge the defenceman in possession. He slipped a pass over to his blueline partner. Hill reached, managed to tip the puck out past the D-man and was off to the races. Nobody was going to catch him. The building erupted. He slipped the puck into the empty net. In the Sunday morning semi-final, opponent Glen Lake was the better team in many respects. Their puck movement was superb for kids that age, and they had Slave Lake pinned in their own end for quite a bit of the first period. Three shots went off the post or crossbar in that stretch, but they failed to score. Then, suddenly, the momentum shifted. Thunder captain Kaleb Van Hoek pulled off one of his patented sweeps around the left D-man, roofing one from a tight angle over the Glen Lake goalie. The Thunder led 3 – 1 after one period on a Damian Hill goal and another one by Van Hoek off another rush, but this time on the other side. Glen Lake got the only goal of the second period, and carried most of the play. They outshot Slave Lake 31 – 19 but were unable to get another one past Thunder goalie Salah Baalbaki, who was solid as a rock. The round robin opener for the Thunder was against Brooks. It ended in a 4 – 4 tie when Brooks scored with 2.5 seconds left in the game. Game 2 against Lloydminster ended in a 6 – 3 victory for Slave Lake. They were up 5 – 0 and cruising when Lloyd struck back three times to make it interesting. The Thunder had almost twice as many powerplays, and scored on three of them. The third round robin game for Slave Lake was against the St. Albert Blues. The Blues were excellent in defense and pretty much stymied the top line of Slave Lake. Jacob Derksen and Liam Dierker scored for Slave Lake, but St. Albert won 3 – 2. That resulted in Slave Lake and Brooks having identical records. The Thunder got through by virtue of more goals for and fewer against, setting up Sunday morning’s battle with Glen Lake. On the other side, LaCrete cruised to a 6 – 3 semi-final win over St. Albert. They’d finished second in their pool, but surprised no one by being one of the toughest outfits in the tournament. Any final thoughts on a successful season? The team consists of eight second-year players and five-first years. Add to that five members on the coaching staff and a lot of hard work and you’ve got a winning combination. A hockey season just doesn’t get any better than this – finishing it off with a provincial championship win on home ice. That’s what the Slave Lake Pee Wee 1 Thunder did on Sunday, beating the LaCrete Lumberjacks 4 – 2 in the final. LaCrete’s Jonah Cardinal sweeps in on Thunder goalie Salah Baalbaki.